Home Features Review: Akitio Neutrino U3+ Drive Enclosure – Aluminum is in! So having an external portable (2.5″) drive is pretty important these days. Luckily for us there are a lot of choices on the market. So how does a brand stand out? Many people shop for a hard drive based off a sale price or what’s in stock, but don’t necessarily compare the differences. For those of us who wish to purchase the exact hard drive of our choice without sacraficing quality and performance, Akitio has created the Neutrino U3 external enclosure. Using aluminum instead of plastic is a welcome feature, especially when a lot of new computers are shipping in aluminum or poly-carbonite unibodies these days. This level of quality not only looks nice, but it also helps with long term durability. What’s special about this case is the full list of connectivity options it supports, along with all the necessary cables. The controller inside the enclosure allows for dual fire-wire (for daisy chaining multiple drives together) and for USB 3.0. USB 3.0 is backwards compatible, so naturally this is also a USB 2.0 drive enclosure. Inside is a SATA controller able to utilize the fastest drives on the market. We decided to install two Samsung 830 SSD’s, one internal, and one external within the Neutrino Case. Using the included, although short (less than one foot long! ), USB 3.0 cable we put the drive enclosure through it’s paces using Atto’s Disk Benchmark tool. 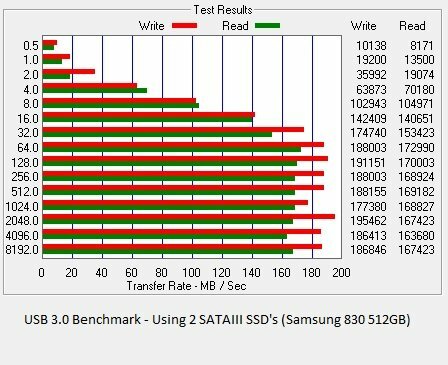 This allowed us to see if it could keep up with the read and write ability of the SATAIII SSD. As you can see, using USB 3.0 on our benchmark (ATTO), the drive was able to peg over 180 Megabytes (not bits) consistantly. 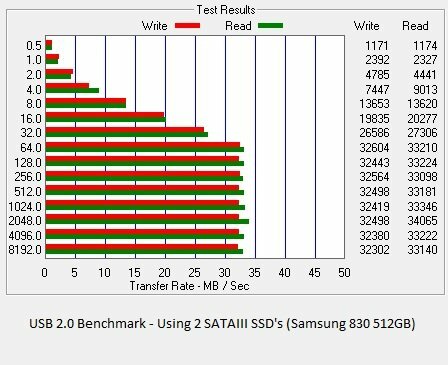 This was using one of the fastest SSDs on the market (the recently replaced Samsung 830 512GB SSD). Using a true SATA connection this drive will dish out over 500 MB/Sec. We then switched to USB 2.0 to see how well the drive controller ran with older technology. Using a USB 2.0 port, we were able to max out typical real world transfer speeds. Knowing that the enclosure won’t bottleneck you in any way is a huge plus. If you have a new and old computer but want to take advantage of both of them to the fullest, this enclosure performs admirably. This unit is passively cooled which is no big deal if you’re using an SSD. For hot running mechanical hard drives like the Western Digital Black or VelociRaptor, the aluminum heatsink will help cope. Almost all 2.5″ drive enclosures do not have an active cooling system, and some have no method of cooling at all. Akitio’s method keeps it silent without reducing the lifespan of your drive due to heat. The only complaint I had about the drive enclosure is the switch. For some reason the power switch always seems to be the weakness of external drive enclosures. Why is this? The build quality is amazing, and then turning the unit on and off makes you feel like it could break any day. This drive is no exception and without finger nails or a lot of pressure, it’s fairly difficult to switch on and off. This enclosure kit is definitely meant for the high tech traveler looking for modern high performing equipment. The included USB cable is extremely short, making it nearly useless for most desktops, but perfect for laptops and travel. Included in the box are plug adapters for international travel. It covers most outlets found in Europe and Asia with a total of four adapters. Also included is an equally short yet functional Firewire 800 cable. Not too many laptops have this plug however, now that Apple has switched to Thunderbolt. You of course get a power cable should you need additional juice, and all the necessary mounting screws including rubber isolators for noise dampening. All in all this is a worthwhile investment, especially with a $69.99 MSRP. Remember this is a high quality aluminum enclosure and should not be compared to the less expensive plastic units out there.